Smart Path takes an automated, holistic approach to patient-centered healthcare to improve the experience for patients and healthcare professionals. Through a centralised hub and information pathways, Smart Path facilitates a patient's journey through your healthcare system, while making it possible for all stakeholders to access and share vital information. This streamlines the relationships between primary and secondary care, hospital services and support care, allowing your health professionals to focus on what really matters - saving lives. While a Patient Pathway can be initiated at any point along a patient's journey through the healthcare system, the Patient themselves is always the common and most important factor. Thus, each Pathway always starts with the patient, and follows their health care journey. A patient will have health care needs to be addressed. Based on our approach, this is where the patient's conceptual journey through the health care system begins. Patients will see their GP, who will address their initial needs. Based on your Smart Path setup, at this point a GP may be able to initiate a Patient Pathway to start tracking, sharing and automating key information. At this point, specialists will assist with targeted treatment. Smart Path makes it possible for specialists to liaise with GP's, and/or hospital staff to manage and track key data with ease, as well as uploading attachments. Your hospital and staff will assess patient needs and provide treatment and services. Using Smart Path, your staff will be able to track status, liaise with specialists, manage notes, and automate reminders with ease. Support services will help the patient improve, and make a better recovery. Even once the patient has left the hospital, Smart Path can be used to keep everyone in the loop, making sure the patient is being well cared for - with automated reminders for anything from days, to months down the track. The Smart Path Healthcare system provides a web platform for health professionals and others to login and manage Patient Pathways. With various tools for adding and sharing data, uploading attachments, setting automated reminders and more, Smart Path revolutionises Patient Pathways. With the click of a mouse, stacan be given dierent levels of access, and patients and their families can also be given personal logins. 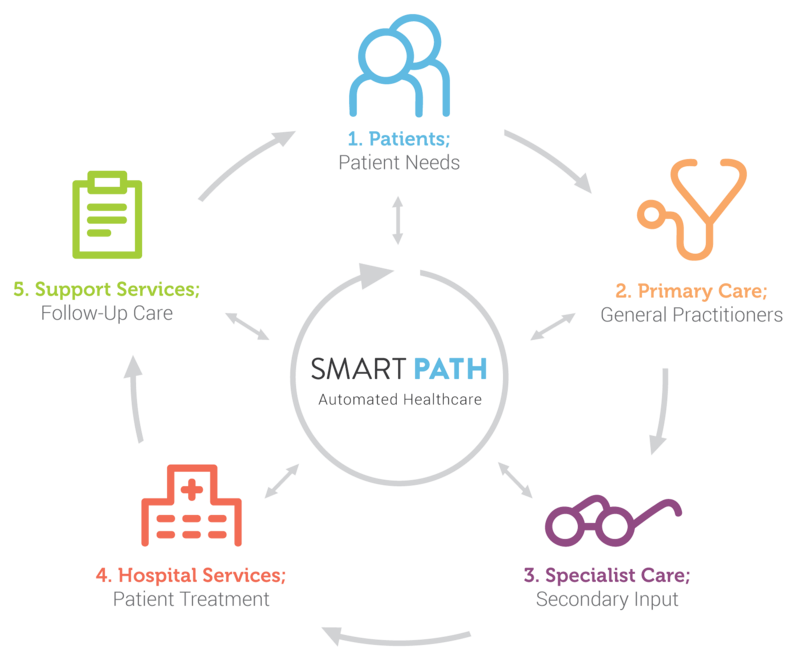 One central feature of Smart Path is the ability to create and follow Pathways for each patient. A Pathway can be created for any procedure from Elective Surgery, Visiting Specialists, Overseas Referral Treatment, or any other service. Pathways allow staff to add and share notes, upload attachments, track costs, set reminders and more. Pathways can either be General Pathways so that staff can track and share notes over time, or they can be Custom Pathways so that staff can share notes and track patient status through various steps. The power of Smart Path is not only in the advanced features, it is in the ability for you to customise any aspect of the platform. We are able to work with you to program in Custom Pathways and to develop unique features. Some of the features that could benefit your Smart Path setup may include custom analysis and advanced reporting, comprehensive medical coding, linking to external systems and support services, or anything else that will empower your staff and patients. Total information control is built directly into the platform. Based on your setup, Smart Path makes it possible for you to authorise patients to access specific information about their own Pathways. This allows them to keep on top of their own health care, stay healthy, and stay out of hospital. Smart Path is a subsidiary of IDESIGN MEDIA, 2 Fitzroy St, Auckland, New Zealand 1021.